So, what has this picture of the most western point of Tromso, looking west towards the North Atlantic, got to do with bulbs? Well I was in the privileged position to be asked by the Friends of the Botanic Garden in Tromso, which is inside the Artic circle in Norway, to speak on bulbs and last week when you were reading the log I was enjoying four days in the far north. Despite the northern latitude they have a magnificent garden and grow an amazing range of plants including many bulbs. 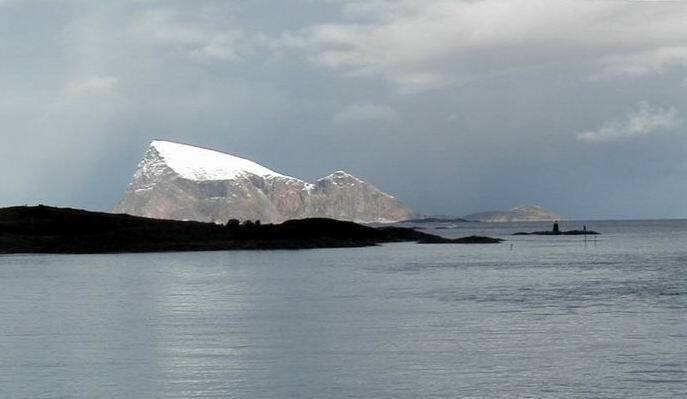 One of my other interests, since I was a schoolboy, has been landscape photography and I could not resist asking my host Finn Haugli to stop repeatedly as we drove down the fiord towards the tiny western islands. 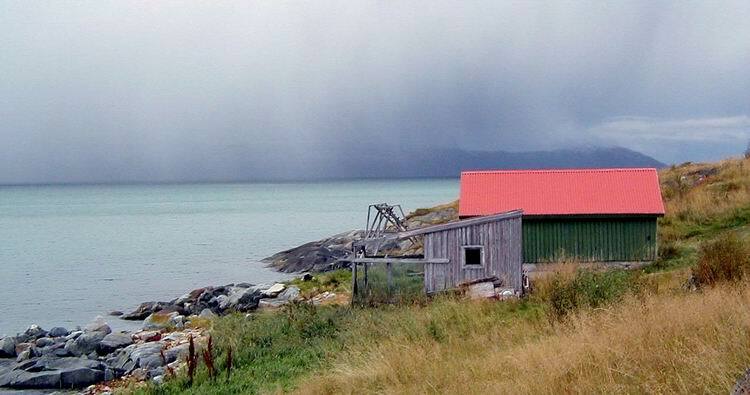 This red-roofed green boat house was just crying out to be pictured, as a rain storm passed down the water. I could easily spend weeks up there, exploring the plants both in nature and the Botanic Garden and revelling in the scenery. I can recommend a visit there any time. I came back to find many bulbs in flower that were not even showing before I left, among them this Sternbergia sicula. 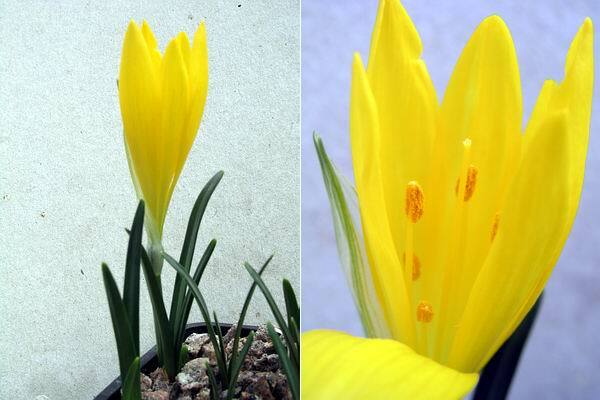 Note the single style, six petals and stamens and an inferior ovary, it is outside the flower, this places Sternbergia in the Amaryllidaceae along with Narcissus. I have been searching for Sternbergias that will flower well in the cooler conditions of Aberdeen and now have a few forms that do flower each year - this is not one of them! This single flower is from a pot of bulbs that I was thinking of getting rid of because they had not flowered until now - was it the threat of the chop that encouraged this flower? n fresh compost were able to produce flower buds for the next season. 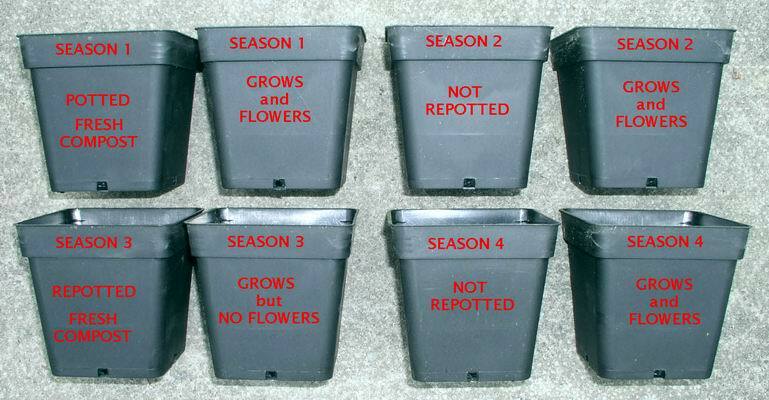 In season 2 they flowered but were in 1 year old compost that was low in nutrients and trace elements, so they were not able to produce the flower buds to flower in season 3. So, it is the fact that they are in old compost the season before, that reduces the chances of them flowering, not the fact that they were repotted. 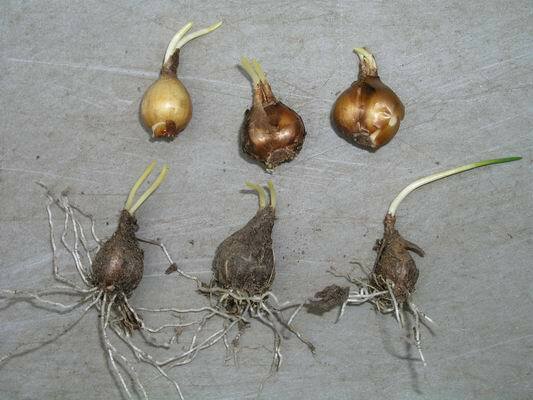 My recommendation is simply that, where possible, you should repot your bulbs every year to get the best results. This is the result of another of my experiments, using various examples of the same type of Narcissus bulb: the top ones have been kept dry and the lower ones have had some water. It is easy to see that the ones with the water have entered the rapid root growth phase but the ones that were kept dry also have root growth starting. The roots are initiating, looking for moisture and they can be held in this state for a reasonable period of time as they wait for water. 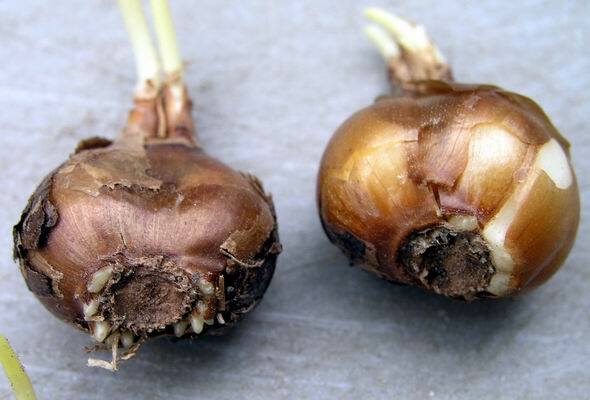 If no moisture becomes available the roots will fail and the bulb will switch into 'survival mode' and have little or no above-ground growth for the season. 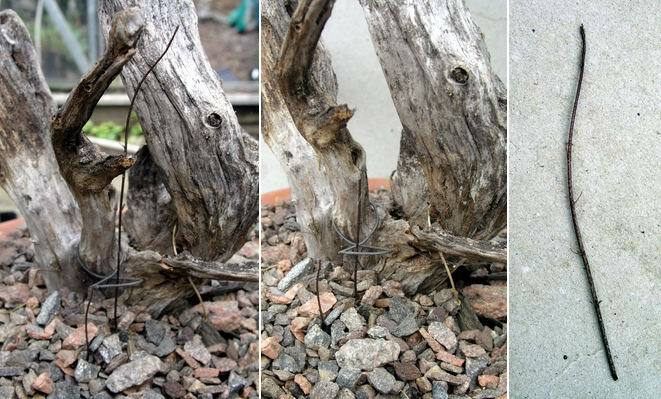 the second and third pictures from the left, show the plant and the bit I removed. Just for interest I am going try and put some roots on the cut off section and produce a new plant. If this does work, I will most likely only get an annual plant, as it will not produce a tuber to take it through the dormant period. 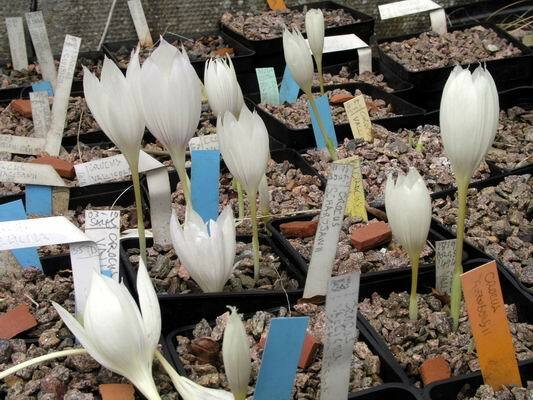 The downside to my trip to Tromso was I had to miss the Late Bulb day where Vic Aspland was speaking about Cyclamen, Vic always gives a good talk and I was sorry to miss them. Among my favourites is Cyclamen intaminatum (left) which is one of the smallest and it is closely related to C. cilicium (right). 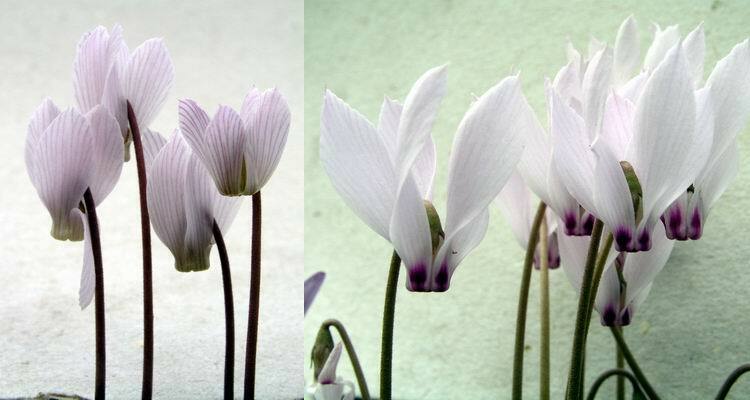 It is incredible to think that cyclamen are in the same family and related to the Primulas. 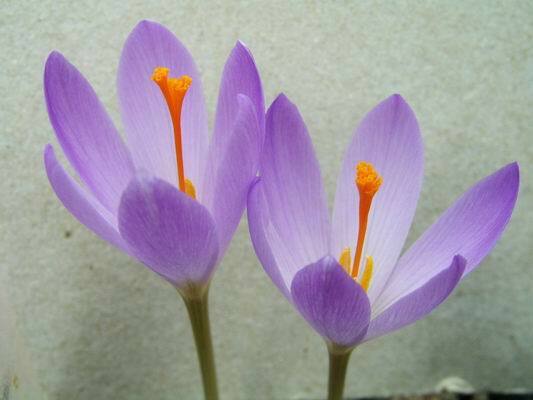 Many crocus are appearing now, including one from Spain which I still have labelled under an old name Crocus granatensis but it should be called C. serotinus ssp salzmannii. 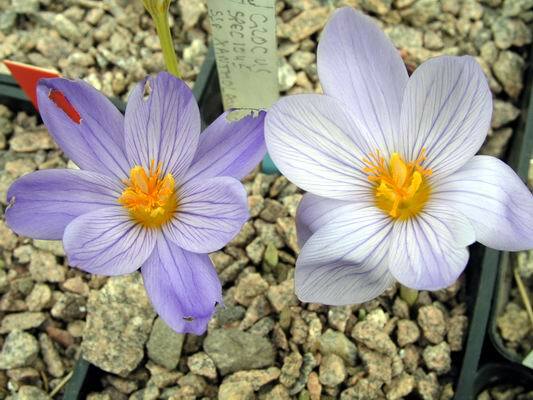 The Crocus vallicola continue to flower, showing quite a variation in flower shape, some short and fat, others long and slender but all with the thread-like acuminate tip to the petals that makes them so appealing to me. 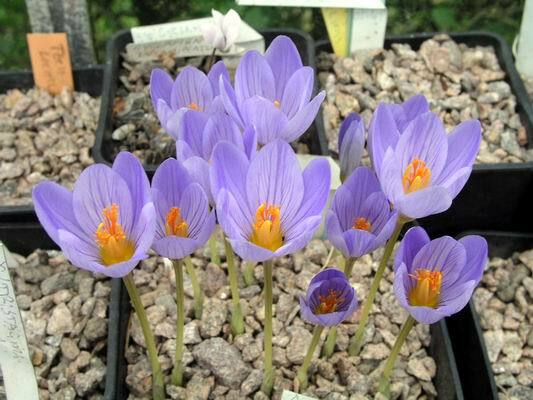 I seem to get more pots of Crocus speciosus ssp xantholaimos every year as it regularly sets good seed and I just cannot resist sowing it. I think the yellow throat, which gives it its identity as ssp xantholaimos makes it even more beautiful than the white throated straight speciosus - all forms of C. speciosus have a delightful scent. It has a fairly consistent look although there is occasionally a slight variation in flower colour when the flowers first open - they tend to fade to a uniform colour. To the most observant among you I found the culprit - a slug.